If you are a sports fanatic, you probably know every single extension and tool that can help you access information fast. Search.heasysportsaccess.com is a search tool that is represented by an extension called “Easy Sports Access.” Both the extension and the search tool are meant to help you access sports-related content directly from the homepage of your web browser, and you might have downloaded it expecting great services. Unfortunately, the extension is pretty useless because its only incentive is to take over your browser, and the hijacker that does that simply displays a few easy-access links. We do not believe that this software is worth anyone’s attention. Unfortunately, it has been proven that not everyone agrees as there are thousands of users who have acquired it already. Polarity Technologies Ltd. is the creator behind this hijacker, as well as Search.search4ppl.com, Search.searchidd.com, and hundreds of others. If you are not sure why they should be deleted, you need to continue reading. Besides the “why,” we also explain the “how” when it comes to removing Search.heasysportsaccess.com. It is essential to discuss how Search.heasysportsaccess.com took over your homepage, search provider, and/or New Tab page; which depends on which browser you use. 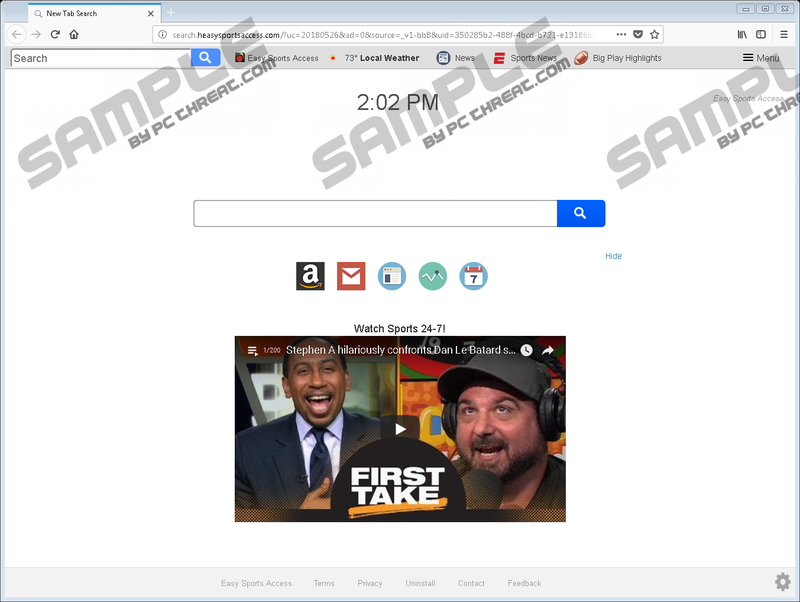 As we discussed already, the hijacker is associated with an extension called “Easy Sports Access.” It is highly unlikely that the hijacker can be represented on its own, and so we assume that the extension is installed on your browser as well. Our research team has found that the extension is available at easysportsaccess.com/Sports? for Mozilla Firefox and Internet Explorer users. Of course, it could be introduced via malicious software bundles, and you might have downloaded it without even realizing it. Are you sure that the extension and the Search.heasysportsaccess.com hijacker were installed on their own? Even if you are, it will not hurt to install a trusted malware scanner. If there is anything else that requires removal, it will inform you about it right away. If the scanner finds threats, you should research them as soon as possible to check if you are dealing with anything highly dangerous. Needless to say, you should delete the most dangerous threats first. Search.heasysportsaccess.com is the clone of Search.easysportsaccess.com; however, since our last report, this hijacker’s interface has been upgraded. Of course, the essence has not changed, and it is still just as suspicious and unreliable. 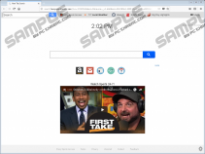 Since the “Easy Sports Access” add-on is meant to provide you with access to sports-related content, it is not surprising that the hijacker offers links to espn.com and nfl.com. Besides that, links to Amazon and Gmail are added too. At the bottom of the hijacker’s home page, you can find a YouTube video that is part of a huge playlist from ESPN’s YouTube channel. This is not all that suspicious, and we do not need to think about this any further. What we need to think about is the search tool. You should NOT use Search.heasysportsaccess.com as a regular search provider because all queries are redirected via extsearch.maxwebsearch.com to search.yahoo.com, and the results are modified to present sponsored content. Interacting with it could be risky, which is why you should stay away. Note that tracking cookies capable of recording both personal and non-personal information could be used to showcase more personalized content to trick you into interacting with the wrong links. If Search.heasysportsaccess.com has taken over Internet Explorer, you need to check “Uninstall a program” or “Add or Remove Programs” menu to see if you need to uninstall an undesirable application. If this hijacker has taken over Mozilla Firefox, you need to look for an extension in the “about:addons” menu. You can use the instructions below if you do not know how to uninstall apps and remove extensions manually. By eliminating “Easy Sports Access,” you should automatically delete Search.heasysportsaccess.com too. Of course, if the hijacker persists, you might have to reset your browser, and if you need instructions on how to do that, please post a comment below. You can also use a legitimate anti-malware program to have all threats erased automatically, and this might be the ideal solution if you need to erase other threats, and if you are concerned about your virtual security in the future. Click the Start menu icon on the Taskbar and then click Control Panel (Windows 10 users can find the utility via the search dialog box on the Taskbar). Access the Uninstall a program/Add or Remove Programs menu. Select the application representing Easy Sports Access and click Uninstall/Remove. Launch the browser and tap keys Alt+T to access the Tools menu. Click Add-ons to access the Extensions menu. Click the Remove button next to the undesirable Easy Sports Access extension. Quick & tested solution for Search.heasysportsaccess.com removal.